I love casual knit tops with a little something to make them stand out from your average tshirt. I made this using a jersey cotton blend knit I got for $2. It drapes just the way I like a tshirt. 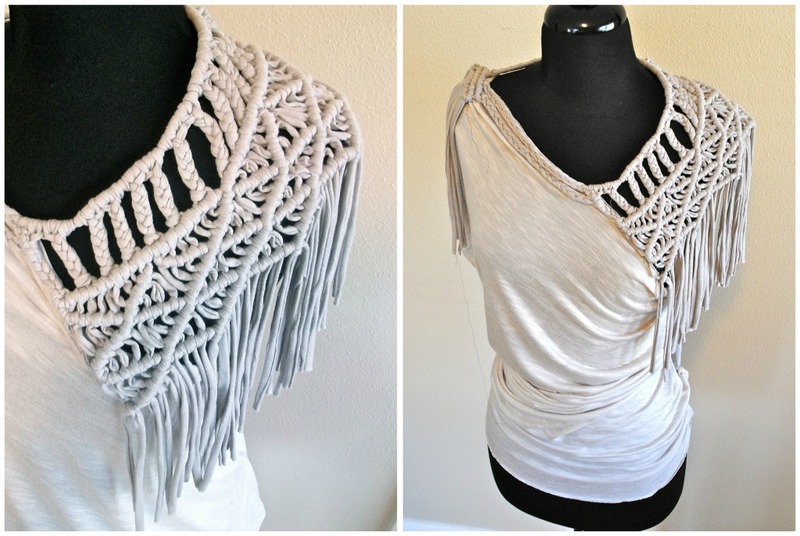 The sleeves were made out of tshirt string and then macrame woven into a cool pattern. I will not be doing a tutorial simply because it will take hours and be so confusing to teach online. I would suggest investing in macrame books if you like this craft. A comfy piece that stands out. Really really nice! i like a lot! this is so detailed. It's chic and casual at the same time. I could wear this all day long!!! OMG please make a tutorial. there is no way i could figure this out on my own. it is sooo creative, i would love to try to replicate it! I have awarded you the Most Inspiring Award because I love your blog and your creativity! Laura, I think you're understating the weaving part, it's incredible! My braiding skills are decent, but there's no way my "playing around" would look anywhere like yours. Please, please, please put up a tutorial of this for those of us with less talent and are in awe. P.S. I've seen your creations featured on Pinterest but so glad I'm finally clicked on your site! Oh my goodness, PLEASE post a tutorial!! Your stuff is awesome, totally fits my style, great designs!!! This is my absolute Favorite piece of art/work you have done! Incredible, the detail is breathtaking!!!!! One could have DIY please ? ?